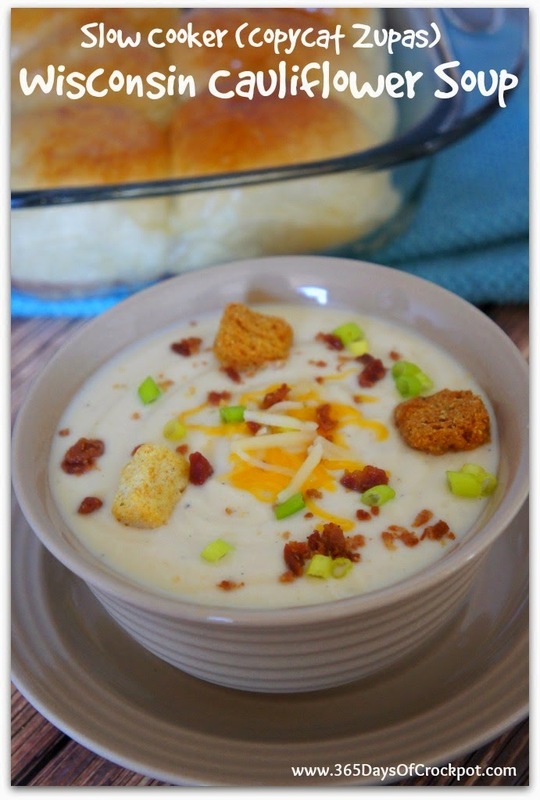 Slow Cooker Copycat Cafe Zupas Wisconsin Cauliflower Soup is a delicious slow cooker version of Cafe Zupas Wisconsin Cauliflower Soup and if you skip the optional croutons, this soup is low-carb! Click here to see 50 Amazing Low-Carb Instant Pot Soup Recipes! Click here to see 50 Great Low-Carb Slow Cooker Dinners! For Friday Favorites we feature past recipes you may have missed, and this Slow Cooker Copycat Cafe Zupas Wisconsin Cauliflower Soup from 365 Days of Slow Cooking sounds amazing. I love, love, love this soup at Cafe Zupas, so if you’re skeptical about Cauliflower Soup, please don’t be! If you’re never had Cafe Zupas Wisconsin Cauliflower Soup, you’ve missed out on a real treat. But if you don’t live in Utah, Arizona, or Nevada where Cafe Zupas is located, now you can make Slow Cooker Copycat Cafe Zupas Wisconsin Cauliflower Soup. Karen says after she tried this creamy, cheesy cauliflower soup at the urging of her sister-in-law, she just had to make it herself, and I’m really glad she did. I love the soups at Cafe Zupas, so this is probably my favorite out of all the good ones there! Toppings as desired: crumbled bacon, croutons, green onion, grated cheddar. Get the complete recipe for Slow Cooker Copycat Cafe Zupas Wisconsin Cauliflower Soup from 365 Days of Slow Cooking. Click here to see all the Slow Cooker or Pressure Cooker Soup or Stew Recipes featured on this site! Thanks so much for posting my recipe! This is a keeper! Karen, I have got to try it, I love that soup at Zupas. Sarah, absolutely! And use some Wisconsin cheese in it too. Hope you enjoy! Wow!! That looks insanely good!!! Thanks Tally! That's what I thought too.